I was reading about the Passover this morning – you know, the very first Passover where God told His people to kill a lamb, eat it, and wipe its blood on their door frame so on the way to killing all the Egyptian firstborn’s He would know which houses to skip over – and it brought to mind my own kind of personal Passover that happened eight years ago on the day the last Harry Potter book came out. It was on the day the last Harry Potter book came out that I found myself sitting around with my friend Brittany trying to think of something to do. I finally suggested, “We could go get me a tattoo.” It seemed fitting, since I had gone with Brittany a couple of years earlier to get her belly button pierced so I called up my cousin and we were on our way. I got the Harry Potter chapter stars tattooed on my left foot to commemorate the release of the last book. I also got three red circles – one of my right big toe, one on my right thumb, and one on the tip of my right ear. It was of these three red circles I thought of this morning as I read about the Passover. In the Old Testament, God’s people were just as messed up as they were now. But before Jesus (and His death and resurrection) the only hope they had of forgiveness and wholeness and restoration and new life was through sacrifices. Something had to die in order for them to truly live. So they would sacrifice a lamb or a goat or a pigeon and the shedding of that animal’s blood signified their forgiveness. The death of one signified the life of another. When God looked at the doors of His people, He didn’t see their doubts or their jealousies or their bitterness. He saw the blood. He saw the death that took place in order for them to have life. And when God looks at me, He doesn’t see my pride or my critical attitude or my shameful lack of patience. He sees the blood. He sees the death that took place on the cross in order for me to have life. My three red dots are a reminder to me that because of one horrific death, I can have amazing life. My dots are a memorial, a remembrance, an altar to the death of Jesus and my resulting life. 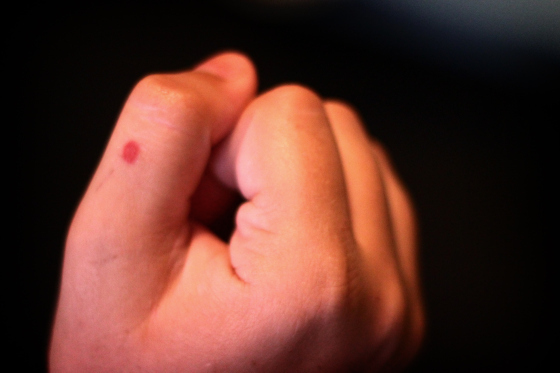 Post Script fun fact: The day after I got my dots I was reading the 7th Harry Potter book (obviously) and I snagged my scabby tattoo on the corner of my hardcover and ripped the color out of my thumb tattoo. It had to be filled in again, but I think the ripping off of the scab hurt more than either tattoo.